Pesto is a fantastic thing to indulge in and one of the best type of food to turn into a medicated enjoyment. Pesto can be utilised and enjoyed in so many different ways, and with so many different foods that it literally becomes one of the favourite foods to infuse with cannabis. Drizzle over roasted baby potatoes, dip fresh bread in, use as a pasta sauce or simply sneak it by the spoonful. Simply put, this is a food item that is enjoyed throughout the world for a reason. Pesto is known to already have quite a kick of flavours. It has, garlic, fresh herbs, olive oil and parmesan cheese- all ingredients perfect for those that wish to disguise the taste of ganja. you can even get your eager hands on plenty of farm fresh basil and make a large batch that you can freeze and keep for some time. That way you will have some infused food to enjoy whenever you fancy! The best way to infuse this recipe is to use cannabis infused olive oil when making your pesto. For this recipe, you will use about 44mg of THC calculated for each serving. If your cannabis oil is made fro the average of 10% THC then use about a half an ounce of marijuana for every cup of oil you want to produce. If you are a seasoned marijuana investor than feel free to amp up the strength however avoid high doses if you have never had marijuana in an edible form before or if you have a lower tolerance. 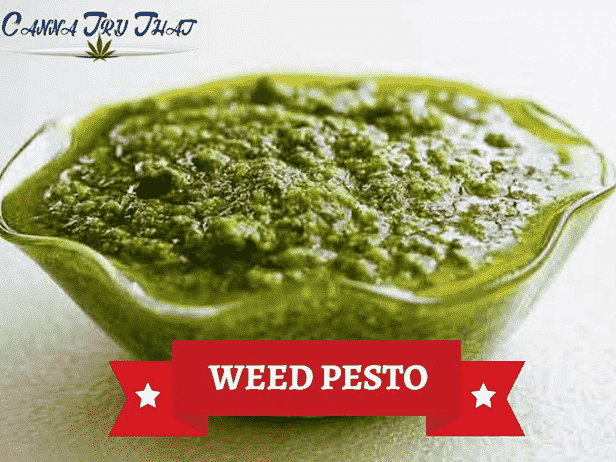 Now that you have your oil prepared and are ready to rumble here is the perfect weed pesto recipe bound to get you high and happy. Preparation time for this happy recipe is a short 10 minutes. Because it is pesto, that means that the total time (unless you want to let the pest sit with the flavours for a while) is 10 minutes. – 1 cup of the freshest basil you can find (if it is in season then try get your hands on a type of sweet basil). Also, basil is best from a local farmers soil! – half a cup of the smelliest (in a good way) freshly finely grated Parmesan cheese. -a quarter cup of nuts of your choice. By “your choice” it means choose between pine nuts or walnuts (these are the best two choices). – salt and pepper according to your own set of tastebuds and judgement. 1.Use a food processor for the best results. Combine in the food processor the basil, parmesan, pine or walnuts and garlic. Mix together these dry ingredients using the processor. 2. As the machine is still whirring away (leave it on a low setting), slowly and gently allow the cannabis infused olive oil as well as the regular olive oil to drizzle into your mixture. 3. Allow the mixture to continue to fully blend for a while and add in a little salt and/or pepper if you like. It is lovely if you have time to allow the mixture to sit together in its flavours for a while. Allow the pesto to sit and ‘mature’ overnight at least. Now that you have you palette pleasing, happy pesto; enjoy with pasta, pizza, potatoes and just about anything else you’d like!